Lad bare Justin have sine beliebers, og One Direction deres directioneers, for Stovt har minimum én tilfreds læser, der heldigvis kaster med flasker i stedet for trusser og bamser. Han har været så fantastisk venlig, at bringe den afbillede flaske fra Almanac Beer Co. hele vejen fra staterne og hjem til bette Danmark, hvor han fra det nordvestlige København har postet den til mig. Tak er kun et fattigt ord, og bedømt ud fra nedenstående beskrivelse, så har han i bedste John "Faxe" stil ramt øllet lige i ræven med sit valg. Flasken er i øvrigt uhørt sexet, der er virkelig kræset for indpakningen. Læs nedenstående beskrivelse og fortæl mig så at du slet ikke er misundelig - jeg tror dig ikke. "This oak-aged ale is our love letter to bourbon barrels. Barrel Noir is a sumptuous, inky ale that celebrates the velvety texture and subtle heat that only Kentucky charred oak can impart. Born from a blend of American imperial stout and Belgian-inspired dark ale aged in bourbon barrels, this rich brew can be paired with braised beef dishes and dark chocolates. Enjoyed best in front of a warm fireplace. Our Farm to Barrel beers highlight the tradition of aging beers in oak barrels. 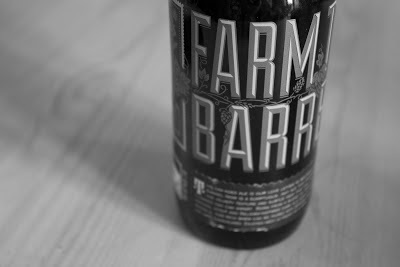 This dark ale is aged in used Bourbon barrels for over 6 months. During this time the flavors of the barrel and beer merge, making something new. As the barrel “breathes” it slowly imparts flavor of bourbon, oak and vanilla into the beer. Inside our Dark Ale brewed with Belgian Candi Sugar slowly evolves, developing more complex flavors and aromas. This slow process can’t be rushed. We test the barrels every few months (perks of the job) and when we think it’s ready, the barrels are drained and blended with a fresh batch of American Imperial Stout. The resulting beer can be aged for up to 5 years in the bottle, where the flavors will continue to blend and evolve."